What’s in a name? Ever thought about how your name could forecast your career aspirations? In researching ‘Weiler,’ we were surprised how the origin of our founder’s name is connected with our industry. What do we mean? Find out below. The Robert Weiler Company is a family-owned and operated commercial real estate firm based in Columbus, Ohio. With three generations contributing to our CRE firm’s growth, stellar reputation, and great impact on the Columbus community (and throughout Central Ohio), it’s no wonder that we’ve been in business for 80 years. A. Robert Weiler founded our firm in 1938. 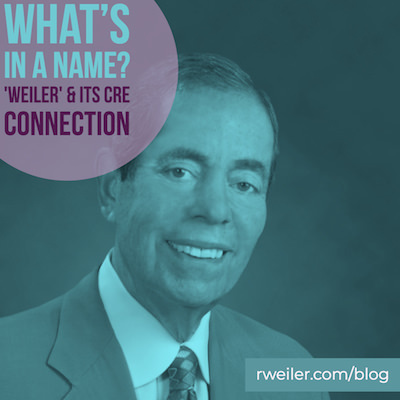 Since then, two additional generations have come on board; in 1957, Robert J. Weiler, Sr. (known to colleagues and family as “Bob”) joined the firm, and in 1985, Robert J. Weiler, Jr. (affectionately known as “Skip”) became the third generation to join the family commercial real estate business. While the history of The Robert Weiler Company is rich, the history of the family name may be richer. So, let’s dig into the origin of the name. We have an affinity for representing our clients in buying and selling farmland; this makes sense, since the name Weiler comes from the Latin word “vilare,” which means farmstead. How’s that for irony? This type of name is topographic, meaning that the original Weilers were likely people that lived near a distinct area surrounded by or defined by hills, trees, or another recognizable outdoor feature. Earlier origins of the name were derived from an aristocratic background, including Hermann von Weiler. He was there for the very beginning of the St. George’s Abbey in the Black Forest monastery in Sankt Georgen im Schwarzwald; it is located in the Southern Black Forest in Baden-Württemberg, Germany. Enough About Us; Let’s Talk About What You Need! We’ve talked enough about us and the origin of the Weiler family name. Above all, we’re interested in knowing about you and the type of commercial real estate you want to buy or sell! Our appraisal, brokerage, development, and other teams at The Robert Weiler Company are here to help you find what you’re looking for, or get top dollar for your property. We’ve been serving as Central Ohio’s commercial real estate resource for 80 years now. And we’re extremely proud of the extraordinary level of services we provide. Call us today at 614-221-4286; we’re available to answer all of your commercial real estate questions. It’s possible that someone named Weiler will answer your call!